I am flying blind on this one. I haven`t yet had a chance to visit the Quercus whisky bar in Ikebukuro, Tokyo and had been hoping to take a peek before giving the Nonjatta seal of approval. 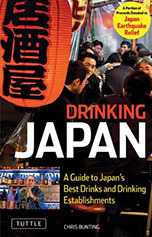 It seems visits to Tokyo keep getting shunted off my agenda, though, so I thought I would pass on this little gem of a tip sooner rather than later. "I used to go to a bar called Quercus in Ikebukuro. It was a really great little place, a lot more casual (and more reasonably priced!) 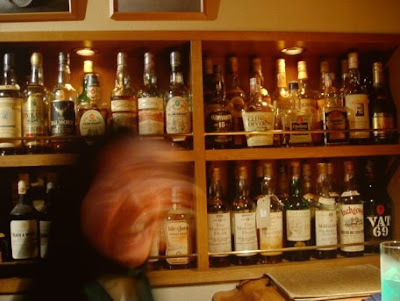 than some of the other whisky bars I tried in Tokyo. I got very friendly with the owner Watanabe-san and some of the locals there. This place is one of the things I miss most since leaving Tokyo. 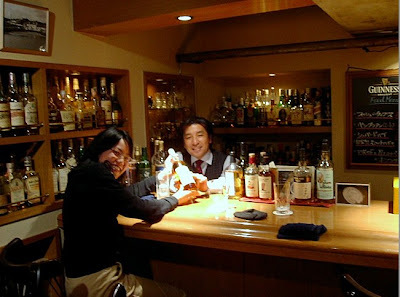 Ichiro Akuto of Chichibu/Hanyu fame was a regular customer there - I occasionally had the pleasure of enjoying some of his excellent malts with him. "Quercus has its own single cask bottlings, just once a year on the anniversary of the bar's opening (around September or October?). To date the ones I've tried have always been from Scottish distilleries, but they're no less interesting for it. Watanabe-san also keeps a good stock of Japanese malts as well - a definite bias towards Chichibu, but I've also had some other interesting specimens there such as Karuizawa, and of course the more commonly available Yoichi, Yamazaki, etc..
"Coming back to London I have been hit by the strange irony of just how few whisky bars there are in the UK compared with Japan. Tokyo seemed to be teeming with them. Those nights where I'd end up staying until 5am and getting the first train back comprise many of my fondest memories of my time in Tokyo!" "Basically you need to get to Toshima Ward Office (Toshima Kuyakusho), and it is more or less next door to that, just a short walk from the east exit of Ikebukuro station. On leaving Ikebukuro east exit you should turn to your left, and follow the big main road, going past a Bic Camera and I think a Zara until you get to the ward office. It's on the right hand side, just after the ward office, in the basement of a building which also has a Mos Burger (if I recall correctly). I'm pretty sure anyone in the area around Ikebukuro station would know the way to Toshima Kuyakusho if you get lost and need to ask for directions." Open 6pm - 4am, Mondays to Saturdays. Closes 2am on Sunday. There does not appear to be an official website for Quercus but John has posted some basic information including a small map at his site. 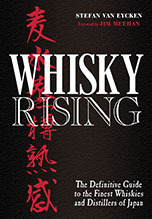 Quercus on Nonjatta's map of Japanese whisky bars.